Nazareth Hall is the social hub of the University. 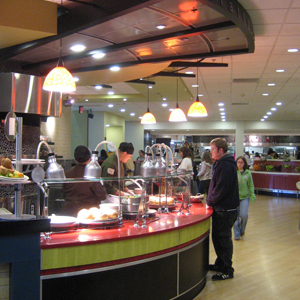 The facility houses the campus’ Main Dining Room, a café-style eatery, two student lounges, two large meeting spaces, a game room, and the Student Center. Renovation of this facility presented a huge challenge for the entire construction team. Work could not begin until the end of the semester, and there was only a 10-week window to completely finish the job before classes restarted in the fall. As part of the construction team, we took the schedule very seriously. The impact of this project not being ready for the upcoming school year would have affected student activities and living on the University campus. Completing on schedule was our focus from day one. The project had multiple trades, design teams, facility staff, and Construction Managers all working in concert in a very small timeframe to complete on schedule.